De lujo espacioso, casa frente al mar mediterráneo estilo, con vistas al mar del Coral en Holloways Beach. Miles de palmeras alineadas playa, situado en frente de la casa. La casa está situada en un jardín tropical, con palmeras y flores en flor todo el año. Casa dormitorio seis, con cuatro de las habitaciones con vista al mar. Escuchar las olas y sentir la brisa del mar mientras se duerme. Tres baños completos, el dormitorio principal tiene un jacuzzi de tamaño completo y un paseo en traje. Una cama de matrimonio, dos camas, dos camas individuales rey, una doble y tres camas individuales. Plazas 13. Cuna y silla alta también está disponible. Amplia zona de estar de planta abierta, con techos altos, escalera de caracol, TV de pantalla plana por cable. Cocina con horno, microondas y lavavajillas totalmente equipada. Comedor separado. Sala de estar con TV de pantalla plana y play station. Ventiladores de techo en todas las habitaciones. Habitaciones con aire acondicionado. Terraza grande, patio y piscina con vistas al océano. Nuestra pareja anfitriona le esperará en el hogar para que se familiarice con el hogar y visitar la zona. We stayed here with 2 other couples for 5 nights. Great location! We loved laying in bed at night listening to roar of the waves. A very spacious, well equipped house. Spacious clean private space! Well maintained wonderful host! 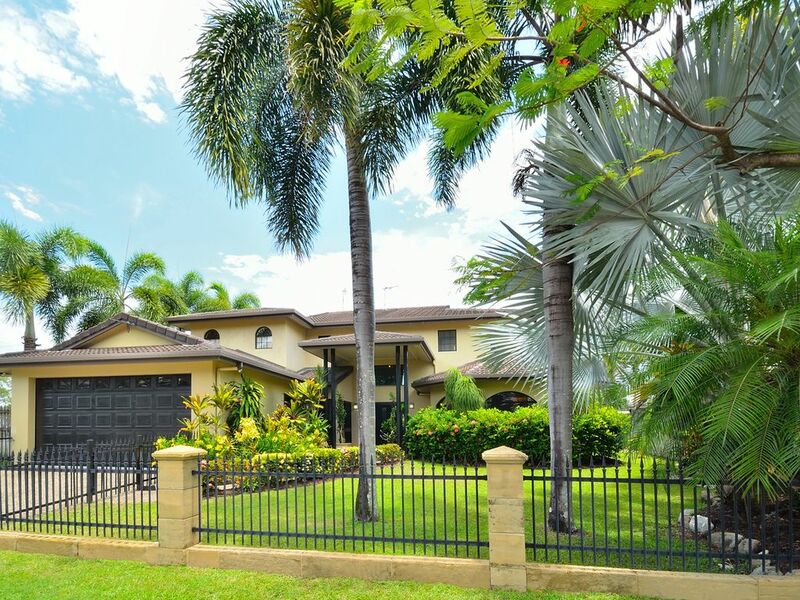 Fantastic, huge home in a perfect location to explore Cairns and all the area around it!!!!! We thoroughly enjoyed the home and especially its location being adjacent to the beach. The home has everything you need in it from bedding, towels and kitchen and cooking equipment. Downtown Cairns is basically a 15 minute drive south and has everything a person could need. Additionally, just to the north on Captain Cook Hwy., is another shopping center for groceries and the like. There is a small interpretive nature trail a short walk to the west that was interesting in the evening as well if you are into that sort of thing. This home is a dream, and I hope to come back and stay again sometime. Well done Kim, and thank you!!!! Thanks so much Jesse, so happy you loved your highly anticipated stay. A very nice , tidy , home to stay in . All the facilities were clean , easily accessible , ensuring a very comfortable stay . Will come back again . Fantastic house in a lovely area. It was perfect for us. Casa Bella Vista was a lovely, big house with stunning views and catered for my whole family. It was the perfect way to celebrate my 50th birthday. I would highly recommend it to anyone. The house is perfect for families to share. We have had two 50th birthdays celebrated at the house, so far this year. So glad you enjoyed your time at the home. Casa Bella Vista was perfect for our group of 3 couples. The spacious home is well maintained, the kitchen has all the necessities and the beds were comfortable. The beach is across the road and was nice for walks. After going on various day trips it was always nice to come “home”, relax in the pool or on the patio, or just hang out in the living room. There is a net enclosed swimming area just down the street by Strait on the Beach restaurant. Holloways Beach has limited restaurants and grocery facilities. Smithfield shopping mall is a 15 minute drive away and has various restaurants, a supermarket, chemist (pharmacy), and shops. Downtown Cairns is about a 30 minute drive from Holloways Beach. If we ever return, we would definitely stay at Casa Bella Vista again. Thank you, Kim and Peter, for making your lovely property available. Nuestra casa frente al mar se encuentra en Holloways Beach, con vistas al mar del Coral, a sólo 10 minutos en coche del aeropuerto de Cairns ya 15 minutos de Cairns central. Hay miles de palmeras alineadas playa directamente en frente de la casa. Dé un paseo por la playa en nuestro café local, bar y restaurante, estrecho en la playa a sólo una cuadra de distancia de la casa.